Iran resumed Tuesday its mass trial of political reformists it has accused of trying to overthrow the government in the wake of the disputed presidential election in June, according to state-run media reports. The nearly 100 people on trial in Iran’s Revolutionary Court include journalists, reformist leaders, and former government ministers. 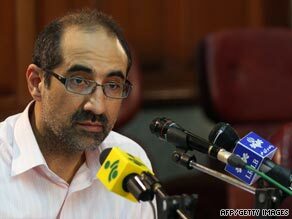 Saeed Hajjarian, a reformist journalist and former adviser to President Mohammed Khatami, testified during Tuesday’s court session, according to Fars News Agency. He “confessed” that he met with Kian Tajbakhsh, an Iranian-American who is also on trial, “in a bid to stage a velvet revolution in Iran,” Fars reported. “During the meetings we agreed to activate NGOs (non-governmental organizations) in Iran and also we aimed to reinforce the civil society (for civil disobedience),” Hajjarian was quoted by Fars as testifying. “We were also supposed to use the experiences of the Soros Foundation in staging a velvet revolution,” he added.